I am sure all of you have thought about cutting the cable TV cord. Yesterday I did. Keeping my fingers crossed that everything works. Worst case go back to the cable TV vendor. There are plenty of reviews on cable TV alternatives, but the guidance is mostly for non-technical people and they focus on things like getting an HDTV antenna. I can’t use an HDTV antenna because all the trees, mountains, and houses that get in way of a signal. And the same applies to satellite TV options. Anyway most important part if you are going to cut the cable TV cord is how good is your internet connection and your network gear? I have a Comcast Business Internet connection which gives me about 65mbps down and 12mbps up. 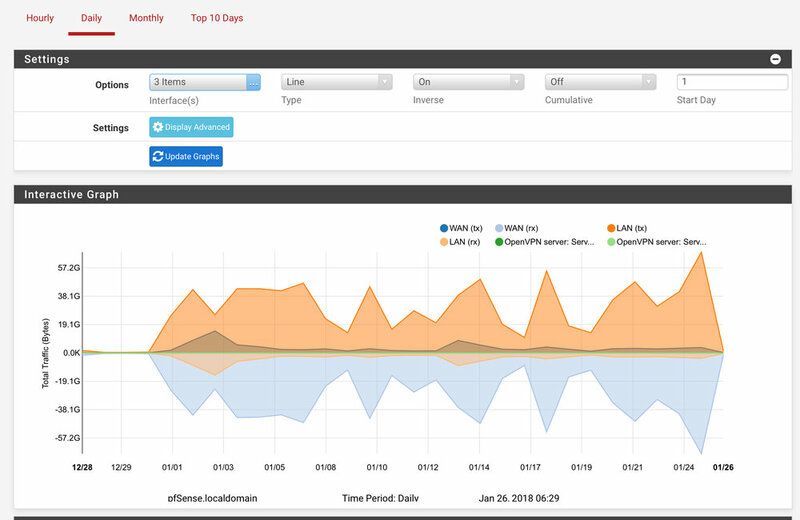 PFsense running on Netgate gives me performance statistics and the ability to do traffic shaping. Here is a daily total network performance. I can see hourly data and get other statistics like the queues. What are queues? Queues are what you set up as how to manage the traffic allocation. One of ways I get customer feedback for how well network is working is whether my son has any problems playing Xbox One games. In the queues there is a specific one for games. Also can see when facetime is being used as well. What is nice is I knocked a hundred dollars off my cable TV package. Part of that cost was $30 a month to rent the set top box devices. For $10 a month I could easily justify spending $200 for a new Apple TV 4K, but don’t have a 4K TV yet. One reason I can make this switch is I have business comcast Internet at home which doesn’t have any data caps. If you do have data caps then you need to worry about your data usage when cutting the cord.